Our hatches are designed to offer convenient, weather-tight access to the roof and rooftop equipment. For convenience purposes, we stock 36” x 36” and 48”x 48” ladder hatches. Our 36” and 48” sleeve-in and curb mount styles of ladder hatches allow you to remove the hatch during curb installation. This also allows you to order the roof hatch without pre-determining latch and ladder location. RCS also offers roof hatches for TPO and built-up roof systems. All RCS roof hatches are designed for long, dependable service. Covers support a 40 lb/ft2) live load. The cap flashing, fully welded corners, thermoplastic rubber gasketing, fiberglass cover insulation and rigid fiberboard curb insulation ensure weather tightness and energy efficiency. RCS roof hatches are designed with the proper number of compression spring operating mechanisms to provide smooth, easy, one-hand operation. Compression spring tubes are made from an anti-corrosive composite material and all other hardware is plated sealed for corrosion resistance. Our stock 36” x 36” sleeve-in roof hatch is less expensive than the commonly specified 30”x 36” roof hatch. Our 36” x 36” sleeve-in design allows field flexibility in locating the opening direction as the entire unit can be rotated 90-180 degrees. The sleeve-in design also allows the erector to remove the roof hatch separately from the curb during roof curb installation. The 36” x 36” sleeve-in roof hatch can be combined with any curb style. 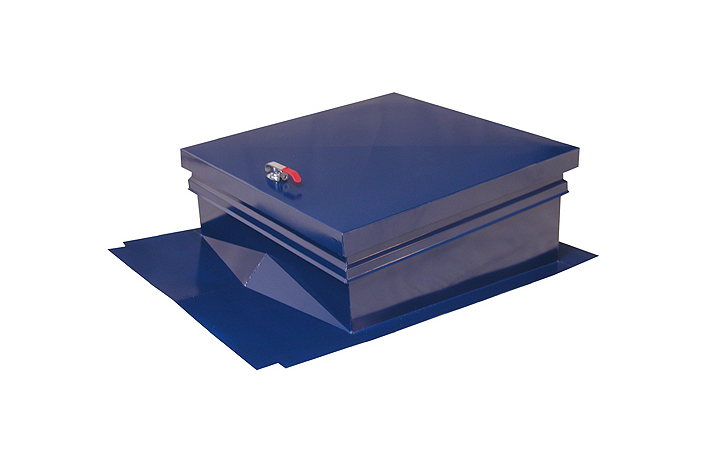 Our 36” x 36” roof hatch is constructed of 0.080 aluminum. Aluminum construction offers an attractive maintenance free finish that never rusts. Our stock 48” x 48” curb mount roof hatch meets the 2006 IBC requirements. Similar to our 36" x 36" Hatch, our 48” x 48” curb mount roof hatch design has the same field flexibility and removal capability to be combined with any curb style. Note: IBC 2006 requires hatches to be 16 square foot. We interpret this to be 48”x48” as we understand the design intent was to allow a firefighter to access with an O2 tank. However, contradictory to IBC, OSHA requires the safety cage to be 27” from center of rung to outside of cage at the top point with a 4" flare at the bottom of the cage. In addition to our stock hatch sizes, we also offer larger stair hatches that integrate with coordinated steps for ease of access. These are constructed similarly to our ladder hatches, but are larger* to provide appropriate clearance while traversing access stairs. The most common size is the 36" X 96" Stair Hatch, but these are also available in custom sizes to meet your project needs. *Note: For Metal Buildings with floating standing seam roof systems a Double Curb System may be required for clearance depending on the orientation of the stair hatch. When it comes to vertical access, trust RCS to coordinate the right solution for your building. Whether you're looking for an inside the building mounted ladder with coordinating roof hatch or an external mounted ladder system, their is no other company in the industry that provides a complete solution for properly mounting these components to pre-engineered metal buildings.